Not your typical osprey platform! For the past two years we’ve worked with staff from the Army Corps of Engineers to enhance osprey nesting habitat within the Shrewsbury River Watershed inside Fort Monmouth in Oceanport, New Jersey. 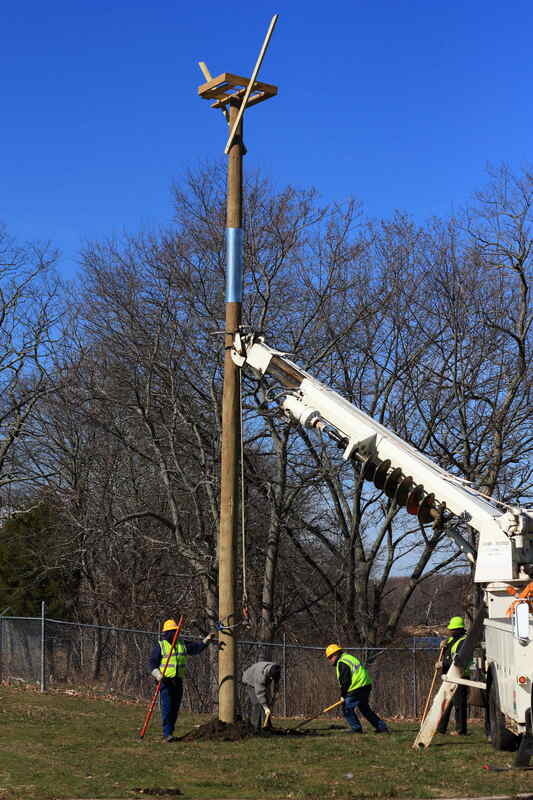 We first began work during the summer of 2009 when an osprey nested on a utility pole at the Fort. The pair had eggs when their nest caused $10,000 worth of damage to a transformer. To alleviate the problem the nest was going to be removed from the pole and the nest would have been lost. Instead Joe Fallon, Chief of the Environmental Division at the Fort decided to install a new pole next to the nest on the live power lines. I met with Joe and gave him a platform “top” and braces to attach to the top of the new pole. After the new pole was installed the nest and eggs were moved. The adults immediately took to the nest platform and successfully raised two young that year. In 2010, they raised another two young that we banded with USGS bird bands. After completion of work this spring there will be a total of 18 nesting platforms there (not including a nest on a light pole over a baseball field). We hope to use part of this funding to install more nesting structures on several islands to the west of Sea Bright and Monmouth Beach in 2012.